• To suggest names for the four new arrivals go to www.facebook.com/ MorningStarBoysRanch. • For more information about Morning Star Boys Ranch, visit www.morningstarboys ranch.org/home/. Four new kids arrived at Morning Star Boys’ Ranch on July 1. But unlike the 18 boys living there, these kids don’t get a private room. Instead, they are staying in a building out back with their mother, Angelina. Last week Angelina, a Nubian/Boer goat, rested in the shade while her four rambunctious, if a bit wobbly, sons huddled together in a nearby shed. A resident gently cradled one of the babies in the shade of the goat pen while the other three nosed among the straw. “They’re herd creatures – they like the attention,” Pebles said. One 12-year-old resident enjoys the time he gets to spend with the goats. At Morning Star’s request, his name is not being used. In addition to goats, the ranch has horses, chickens, a dog and a barn cat named Fluffy. All of the residents participate in 4-H, and Irwin said the therapeutic riding program has been especially beneficial. Along with caring for the newborns, he’s helping get Angelina’s daughter Oreo ready to show at the Spokane County Interstate Fair. Last year the pair won Reserve Grand Champion for doelings. 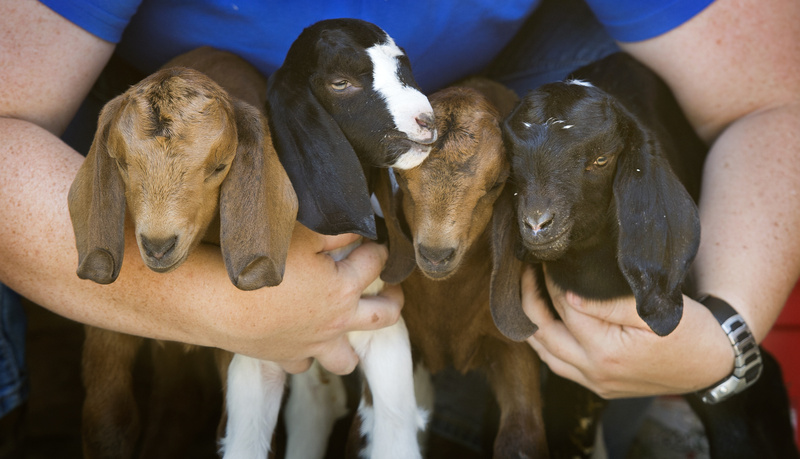 Residents and staff expressed delight at the additions to their growing goat herd.